Ringo struggles with his training and tells the coach he's healthy. Declan tells Ringo he won't make a habit of covering for him. The girls take pregnancy tests, one is positive. The three girls are sat on the couch looking distracted. Bridget and Rachel are holding their dolls. Elle gives Donna her doll back suggesting it needs new batteries. Elle goes to make some hot drinks. Rachel tells Donna she can't believe she mucked up the tests. Bridget says the only solution is to take the test again. Paul's working on the Apple, so Elle gives him his drink and remarks ‘there's something going with those girls'. Paul says ‘they're teenage girls, there's always something going on'. Elle says she's staying home to keep an eye on her. PAUL: You're sounding more like your mum every day. Bridget asks Rachel how accurate the tests are. It's 98%. Donna says that's good, there's a 2% chance it was wrong. Rachel point out there's still a 98% chance that one of them....Bridget shushes her and Elle tries to fake a smile. Rachel says they have to get more tests. Bridget and Rachel say they both feel sick. Donna says it needs to stay between them. Rachel says that could be a problem as Donna realises Zeke knows something. Bridget worries he'll tell Karl and Susan. Rachel says she'll talk to him. The girls all pinky-swear on it. Elle comes over with the tea tray to ‘have a chat – just the girls'. Suddenly they all, including Donna, say they have to go home. Donna sees the other two out and turns round to see Elle standing behind her. She makes an excuse about doing her homework and goes upstairs. Paul comes past her to go up the stairs and she tells him there's definitely something going on. Paul dismisses it. Dan wants to begin the class discussion on the Baby Programme. Donna asks him where Miss Kennedy is. As she hasn't arrived yet, Declan suggests she slept in and had a late night and pulls a face. Dan calls Rachel, Bridget and Donna up to talk about how it went. Rachel says she'll be glad to give it back, but Dan teases her saying who said anything about giving it back? You can't just leave a baby. RACHEL: But I didn't have a baby. ZEKE: Haven't you put the family through enough? DECLAN: Don't look at me! RINGO: You were desperate for someone to love you, now you've got it. DONNA: But I don't wanna have a baby! BRIDGET: But I don't want it! DONNA: It's great! Great! I mean, not for me, I don't want one, but yeah, if you want to be a parent, you should totally have a kid. Bridget says she doesn't think she could be a mum. Zeke thinks he and Rachel did a great job, and with a smile on his face says she's really cut out to be a mum. She says she had help from her ‘fantastic' partner. Dan tells the girls to sit down and gives everyone a little lecture about parenting then says Donna and Ringo were the most successful team. Ringo gets high fives from his mates and there's a little applause. Donna is upset because he just left the baby with her as he showed off to the football groupies. Bridget tries to shush her, but it's too late. Donna says ‘we' saw them with the skanks. Declan realises Bridget was there too. The beeps go and Rachel follows Zeke out to the lockers. She wants to know what he's doing to her. He says he's giving her a reality check. She tells him to cut it out, but he wants to know what's going on. He asks if the pills in the bin had something to do with Ty. Donna comes over and admits they were hers. She says she chucked them out because they didn't agree with her and now she's taking a different one. Zeke looks like he doesn't believe her and walks away. Declan and Ringo walk in joking that they're famous because they have stalkers. The girls deny stalking, they were just interested. After a brief exchange about them signing the girl's ‘bits' Ringo tells Donna she did well with Tiffannii. He asks her if they can go out after school. She looks starry eyed at him, but Rachel and Bridget pull her back saying she's too busy. Declan tells Bridget she's got nothing to worry about where those girls are concerned, then gives her a kiss as the beeps go. The boys leave, the girls put their money together for the tests and Rachel is persuaded to go buy them. Karl is asleep on the couch with Dahl beside him, squawking away. Libby comes in and turns the TV off which wakes him up. He should have been looking after Ben, who's disappeared while he was asleep. Susan comes in and tells them he's in Zeke's room on the computer. Susan asks how thinks went with Dan. ‘About as good as they could be' is Libby's response. Her parents try to reassure her that everything will work itself out. Libby says she won't have to worry about him much longer if he goes through with the race. Karl says sometimes you have to let men do what they do. Susan orders him to bring the washing in and tells Libby Ben's been asking about Dan. Libby says she's worried about how to tell him, and Susan agrees that telling him will make it final. Ben then comes out and guesses he's being talked about. Dan comes in and sees Susan with Ben. He comes over to say Hi to Ben, who's giving him the cold shoulder. He's heard Dan's leaving and he ‘knew this would happen'. Dan says he's not leaving, they can still hang out he just won't be living with them. Ben points out that's what Darren said. He says his mum's a liar, because she promised Dan would move in. Susan says sometimes it doesn't happen that way. Ben wants to go home and they leave. Him ignoring Dan, Susan telling Dan to try to talk to him later. Rachel comes in with a bag, embarrassed that she had to buy the tests, she bought other stuff so it didn't look suss. Elle comes in and they quickly hide the bag. Donna tries and fails to make small talk with her, but Elle is suspicious. She asks if Donna has spoken to her father. She covers by saying it's the ‘whole Rachel and Ty' disaster and Bridget puts a comforting arm on Rachel's shoulder. Elle tells her she can talk to her about anything. The girls leave to go back to school, but check to make sure Elle will be out tonight first, which she will. Paul comes downstairs as they leave and Elle tells him she can't work tonight as she has ‘a study group to gatecrash'. 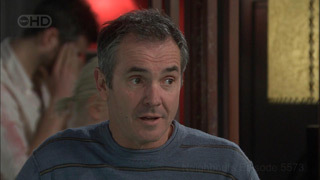 Paul suggests to Elle that Donna is having an affair with one of teachers, which shocks her. Steve, Karl and Lou come in. Of course Lou's heard his name and wonders why. Paul tells him he can help Elle with her problem, while he goes to work. Lou tells her it'll cost her a drink. Steve tries to get one too, but Lou won't allow him as ‘Your wife is a very persuasive lady'. Elle asks them if Rachel and Bridget have been acting out of character lately. Karl says they're teenagers and you have to trust them. Elle says that's what Paul said. Karl is shocked to find he agrees Paul is right. He advises her not to gatecrash the study group. He says he's sure she'll go to her if there's a problem. Donna says she wouldn't tell Elle anything. Bridget wants to take the test now, but the other girls aren't keen. The beeps go. Ringo comes in and tells them a new burger bar's been shut due to food poisoning. Rachel says that explains why she was sick. Declan says she could sue and the boys sit down. When they're gone Rachel says she's still late. Libby comes rushing in late and they sit down. Dan comes in. He asks her how Ben is. She says he's devastated. Dan says he just wants him to understand he's not going to lose him. Libby says how can he promise he'll come through the race in one piece? Libby turns to the class and Dan leaves. Ringo and Declan are working out when Steve and Karl come in. Steve praises their ‘Dingo Spirit' and asks how it's going with the big boys. ‘It's tough' says Declan, at least they have each other says Karl and the men walk off. Ringo tells Declan he never misses an opportunity. Declan says he won't cover for him again. Either he gets it together or they could both be out. The men come back and ask if there's anything wrong with the girls, because Elle says Donna's been acting a bit weird. The men leave and the boys look puzzled. The girls are upstairs. They've taken the tests and are waiting for them to change. Downstairs, Elle sneaks quietly in. Rachel counts down the time and Elle talks to the cat. Bridget says ‘We take care of each other no matter what'. Rachel finishes the count and they look at the tests. One has changed colour. Elle puts the cat down and walks upstairs where Bridget has her arms around an upset looking Rachel and Donna. She bursts into the room with an ‘I knew it' before noticing the tests. She asks Donna who's is the positive one. Donna says nothing but looks about to cry. Elle says they have to tell her who's pregnant so they can get her some help. Huddled together, they're saying nothing. She tries to convince them each in turn to say something, but they just look upset. Elle threatens to tell their parents, and they all beg her not too. Next we see them rushing downstairs; they pass Paul as Rachel and Bridget run out without a word. PAUL: Elle, have you been frightening the children again? (pause) Actually, I don't want to know! Elle and Donna leave to go for coffee, as they have a lot to talk about. Libby is trying to get Ben to clean his teeth, but he's being defiant. Libby says he promised, but he points out she doesn't keep her promises. The door goes. It's Dan. He's brought over a fishing magazine for Ben. He says it's so they can plan their next fishing trip. This makes Ben very happy as he takes the magazine and goes to clean his teeth. LIBBY: That was a cheap bribe. DAN: But it worked. I don't want to hurt either of you Lib. LIBBY: But you're still racing. LIBBY: You going to kill him this time? Karl and Susan come in and he's joking about his muscles following his trip to the gym. Elle comes over and asks Lou how long he's going to take. He snaps that the boss should put extra staff on. She talks to Karl and Susan, who want to know what's going on with Donna and whether it has anything to do with Ringo. She tells them it doesn't. Karl says parenting's an endurance test....Susan jokes Karl can recommend someone to talk to! Elle goes and sits with Donna, who is keen to point out she won't blab, no matter how much Elle bribes her. Elle says it isn't blabbing, it's serious. DONNA: You're not my mother. ELLE: Well maybe I should give her a call? DONNA: Yeah, good luck making her give a damn! With a bit of persuasion, Elle finally coaxes out of Donna that, no, it's not her that's pregnant. At another table, Karl and Susan choose this moment to burst out laughing hysterically. The three girls meet outside in the dark, all wearing hooded tops with hoods up. Donna says Elle tried to get the truth out of her, but she didn't budge. Bridget asks if she's OK and she just shrugs. Bridget asks if Elle's going to tell anyone. ‘Not tonight' guesses Donna. BRIDGET: Well this is something we keep really close. No-one else knows. RACHEL: Well, we're all in this together, yeah? The girls link pinkies. Bridget looks shellshocked. The other two just look sad. Bridget walks up the street, head down, almost crying. The other two watch her. She stops in front of the camera, looks towards No 24 and heads off in that direction.